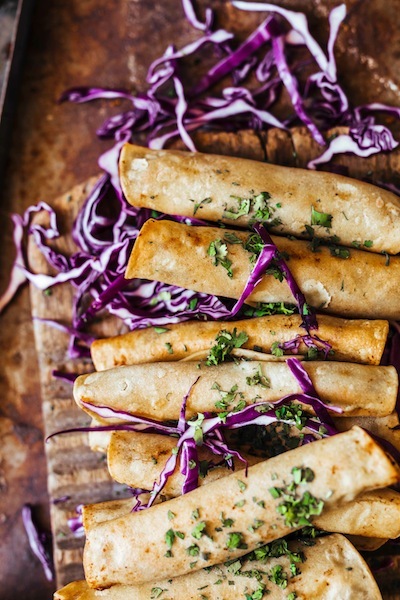 flavor and crunch, these soul- satisfying vegan taquitos by Kate Ramos of Hola Jalapeno have a filling tasty enough to serve as its own side dish. For easiest prep, use tortillas fresh from the store that haven’t been refrigerated. Serve taquitos with guacamole. Note: This recipe calls for toothpicks. oil. When shimmering, add the onion, garlic, jalapeño, and 1 teaspoon salt. Cook, stirring occasionally, until the vegetables are tender, about 5 minutes. Add the cumin, coriander, and chili powder and stir for 1 minute. Add the black beans with the can's juices. Bring to a simmer and cook, stirring occasionally, until the beans are thick, about 8 minutes. Remove from the heat and immediately mash the beans with a potato masher until most are mashed and the mixture is thick. Season to taste with salt. Let cool slightly. Heat a cast-iron or nonstick skillet over medium heat. Warm the tortillas one at a time until they are very flexible, about 1 minute per side, then immediately wrap them tightly in a clean kitchen towel to keep warm so they don’t cool and break when you try to roll them. In a large, deep frying pan over medium heat, pour enough oil to reach 1 inch up the side of the pan. Heat the oil until a deep-frying thermometer reads 350°F, about 10 minutes. If you don’t have a thermometer, the oil is ready when a small cube of GF bread browns in the oil in 30 seconds. a tight cylinder. Using a toothpick, gently fasten the flap of the overlapped tortilla to the rest of the tortilla like a sewing stitch. and fry until brown and crisp, 2 to 3 minutes. Flip and brown on the other side, about 1 minute longer. Remove with tongs to the prepared baking sheet and repeat. Remove the toothpicks and serve immediately.